Web design Sydney is your most powerful weapon in the war for digital leads and revenue. Never take it for granted. Because you are still yet to discover how much it will empower your business. See it in this perspective. Of all small business in the world, 71% have a website. Ergo, as a small business owner yourself, you can only guess how much competitors are there. Now, with the right support, you can get clients to find your website above all others. But wait that is just the first part. Any visitor in your website will swoop out in a second if they think you don’t have what they are looking for. Or simply, they just don’t like your website’s design at all. Ergo, it’s a war on which business has the website design that will do its job converting business opportunities into leads and revenue. And to win every battle, you need to make sure you wield the best weapon—your website. Furthermore, doing that may take some process and expert resources. 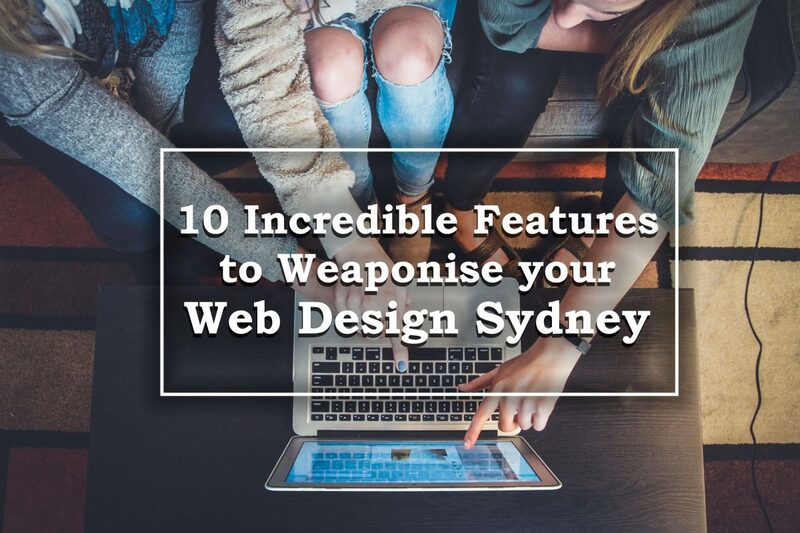 But for starters, you will need to secure these 10 features that will weaponise your web design Sydney. A designer’s eyes see details but a typical observer sees only the summation of the details of the overall design. But don’t get it wrong. The individual details make the summation spectacular. Ergo, when you revamp your site, keep all details in mind and impress your visitors upon landing to your site. The most vital product that your website should give each potential client is information. Thus, effectivity in offering such a product relies greatly on the matter of relaying it. Make sure that upon landing on your page, the user can easily find the most vital information that they need to know. Structure each tab and button following this consideration and you will have a website that sells. Call to actions is one of the greatest and most important products of a web design Sydney. Make sure to have a compelling call to actions on each tab and places in your site. Especially on the home page, services/product pages and blogs. Answer the question “what’s in it for me” in a concise manner. Highlight benefits but don’t oversell. Most customers will see through that. As we all know content is king and its reign will never end. So, make sure your web content is rich with useful information whilst marketing your service. Make the most out of its power in the digital world. And you should get more from your investment. This is not your autobiography, neither nor your company’s documentary. It is a page where you answer the question “why your client should take advantage of your deals?”. In other words, this is where you showcase why people should get your service. Hence, when they look at your about us page, make sure to highlight the things that make you remarkable and why you’re way better than your competitors. If your web design Sydney looks smashing on a desktop view, it should be just as incredible as it is on a mobile view. Most all people nowadays prefer searching through mobile due to the convenience that it brings. There are about 4.77 billion of mobile phone users all over the world. Therefore, never take the population of mobile users for granted. Don’t just have a website for the sake of having a website. You might miss just as much if you neglect it. Updates and innovations are constant in the digital world. That’s why it is very important to establish a design that is flexible enough to immediately update whenever a new trend comes up. And most importantly, this design should also have all of what you need. Keep track of your website’s conversion. Make sure it has that ability or at least secure a resource that will do it for you. This is for you to know if the design is working or not. In this way, you can optimise your website much more effectively. Knowing these features is one thing. Finding the right people that will implement them on your site is another. But when it comes to superb web design Sydney, Aleph IT team is your number one choice. If you need quality web development work, then might as well get the best team to do it for you. Do you want to check more awesome posts? Find good reads from our blog posts. The team will be publishing more quality insights about web development and more. Let them show you how it’s done. Unsure whether you need WordPress experts? Check out Reasons you need WordPress experts now! This entry was posted in Web Design and Development and tagged affordable web design, Aleph IT, best web design, responsive web design.